Form 1040-X allows you to amend a tax return with incorrect or omitted information. 2. What Are Some Reasons My Tax Return Can Be Denied? Tax season brings a ton of paperwork, tax jargon and stress. It's not difficult to forget to add something to your tax return before you send it in. The IRS even provides a quick, efficient means to amend a tax return to get the correct information filed. Failing to add your income to your tax return lowers the amount of taxes you owe. You must amend your federal tax return with omitted income information as soon as possible to avoid penalties and interest charges. To correct your state tax return, contact your state tax authority. If you discover errors in your tax return, you may need to amend your return. The IRS service center processes your tax return and makes adjustments for simple math errors. The service center does not correct filing status errors, complete omissions of information or incorrect deductions. When you completely omit a person's income, you need to amend your return. Your total tax bill depends fundamentally on your total income earned. Deductions, exemptions and credits change the number, but the foundation of your return is your income. Failing to add your income to your tax return lowers your total tax owed. Even if the mistake was not intentional, you may be held responsible for misrepresenting your tax liability on your tax return. As soon as you realize your error, you need to amend your tax return. The IRS assesses penalties, late fees and interest on taxes owed. The sooner you amend your return and pay any difference owed, the less you pay in fees to the IRS. The IRS allows up to three years from the date of filing to amend a tax return. 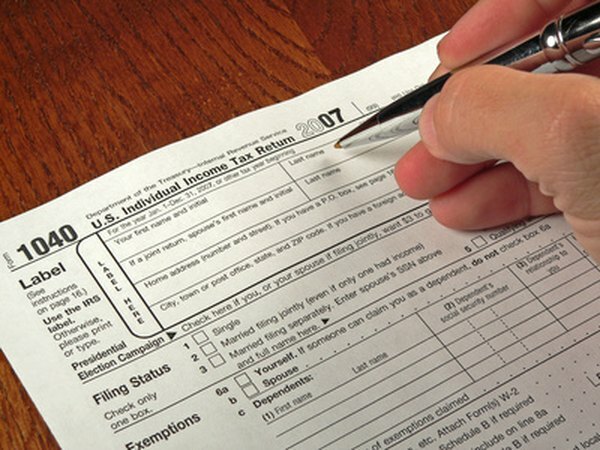 Download Form 1040-X from the IRS website or call the IRS at 1-800-TAX-FORM to get a copy of 1040-X. Similar to the original 1040 form you filed, 1040-X is a condensed form that allows you to enter the correct information for your tax return. Under the "Income and Deductions" section of the form, enter the previously entered amount. Next to that amount enter the net increase or decrease between the previous amount and the new amount. In the following column, enter the correct amount for your total income. Fill out the rest of the form including the explanation section. Mail the form to the IRS. You cannot electronically amend a tax return.